A Short Story: To Speak or Not? Sorry for not writing much here lately (in the English version of my optimiced.com blog). The statute of national park of mountain Strandja was about to be changed so that some companies to be able to build big resorts and hotel chains there. Many people here in Bulgaria are against this decision and suddenly it became an activity, something like a flash-mob (unorganized civil protests). Many young people who care about the preservation of the nature started to protest peacefully, and their meetings were very quickly and spontaneously gathered after calls in a few blogs and Internet websites (including official media). I felt involved as I care about the nature in my country, Bulgaria, and because this subject is important for me, too, I started to blog about it, using information from all around the blogosphere – copying it & quoting it. I also went personally on some of these “flash-mobs”, made photos and posted them on my blog. I also posted a couple of reportages, including my comments on the “Strandja” case and on the ongoing peaceful protests. I never thought this could be something illegal – many official media wrote about the remonstrances and numerous bloggers did it just like I did, many of them even used stronger language than me and aggressive words, which I don’t like. Last week I received summons to visit the Sofia Metropolitan Police Department and absolutely not aware what is this about, I just went with questions in my head, but with a clear heart. There they asked me about my website (my blog) and about the Strandja protests. I had to write some explications and also signed a warning protocol, saying that I should not write in my blog anything that could call to disorderly conduct (like unofficial protests) and so on. I saw a line in the police documents, saying “the website www.optimiced.com must be investigated (watched constantly)”. I read on the top of the documents in front of me the name of the National Service for Combat against the Organized Crime, which indeed puzzled me. Also there were printed sheets of paper from another blog of a guy, who wrote as well about the Strandja case, and he is also a journalist. On the stairs one of the police officers told me “in private” that I should be more careful what I am writing about in future, because journalists have a better defense against possible prosecution and I am just an ordinary person, an independent blogger. That was the story in short. I had the feeling that it’s somehow strange that our police and also the National Service for Combat against the Organized Crime are so busy with investigating people like me, while there are so many criminals out there, but what do I know? I am just a man, now concerned in what kind of a country I dreamed to have kids? I decided to tell the story on my blog and I did it. But I wasn’t prepared for the avalanche of comments and people feeling concerned by this precedent, because the whole blogosphere felt that this as a strike against the free speech in the virtual world in Bulgaria. Now my only wish is all of this noise to end, but alas. I said “no” to some media (a lot of reporters wanted to take interviews from me), because I didn’t want to became a media star. One TV said that I was one of the organizators of the protest, which is not true and is ridiculous. Nevermind, I agreed for a short appearance in a morning broadcast on the Bulgarian National TV (www.bnt.bg), just to show that I am not “virtual”, but a real person, and also because I was told that in the studio we’ll have as a guest a representative of the Police. But they just sent something like semi-official statement, where all the mentioned reasons for the investigation against me and my blog were so weak that even I can tell you they will not stand in the court. I don’t want to sue anybody for libel, even if I have the right to feel dirty after all this witch-hunt. I only want this to come to an end and my name to stop being used like a chewing-gum from the media. I still believe that I didn’t break any law with my writings here. If somebody thinks the opposite, there is court, please, prove these non-sense accusations. All plugins are OK – the few I use include LightBox 0.6.4beta, Google Sitemap 3.0b6, WP-Shortstat 1.12a. WordPress powers optimiced.com from January 1st, 2007. I like a lot WP from the moment I started to use it. The first version I’ve installed was 2.0.5, and then WP 2.0.6 was out, then 2.0.7, 2.0.9, 2.1 “Ella”, 2.1.1… and only then I decided that it’s time to upgrade. I did. But on the next day, after I have successfully made backup of the database and of the files and upgraded to 2.1.1, a serious possible security problem was discovered in 2.1.1 and news was spread we should upgrade as soon as possible to 2.1.2. I used 2.1.1 for a few weeks and only tonight have decided that the right moment has come, and after a new series of backups and strict adherence to the instructions, I am already with 2.1.2 up and running :-) Same applies to the Bulgarian version, of course. Sounds incredible, but Ani has discovered yesterday that there’s a galaxy a pair of galaxies called The Mice (NGC 4676)! Wow! 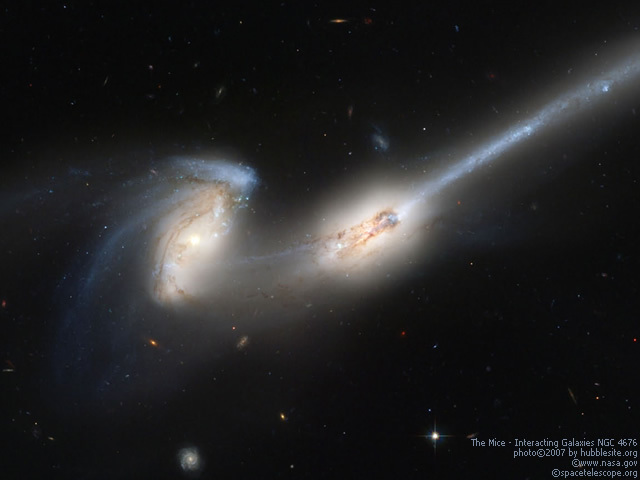 This pair of galaxies, NGC 4676, also known as “The Mice” for their tails of stars and gas, have collided and will eventually merge into a single galaxy. Streams of material have been tugged out of the galaxies by the force of gravity, triggering new starbirth.